Sanded Goose ... new addition to the Urban Series collection. Staron – a solid surfacing brand of Korea-headquartered Lotte Advanced Materials – has introduced two new finishes to its Urban Series collection. These include Aspen Misto and Sanded Goose to create a feeling of subtle urban style. “Designed with modern living in mind, the Urban Series collection from Staron introduces an effortless urban character into interiors. Inspired by the wave of contemporary, industrial design trends that have captured the interiors world, 2019 sees the introduction of two new finishes to the collection,” says a spokesman for Staron. Inspired by the sights, sounds and energy of a vibrant metropolitan environment, each of the Urban Series surfaces offers a modern, refined finish that will enhance any residential or commercial setting. “With 10 colour options to choose from, opt for Steel to evoke an on-trend industrial feel or select the softer and more detailed Sanded Goose,” he says. 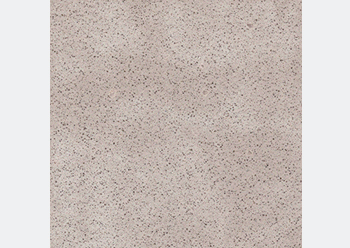 As with all other solid surface products from Staron, the Urban Series collection has been developed especially for use in residential and commercial applications. Combining a stunning appearance with outstanding practical qualities, the award-winning and revolutionary solid surface is a sophisticated blend of natural minerals and thermosetting acrylic polymers. “Both hygienic and durable in equal measure, Staron’s exceptional practical features offer total flexibility when it comes to design. A non-porous material that is impervious to moisture, Staron provides a seamless finish on any shaped surface,” he adds. Vincent ... art deco inspiration. 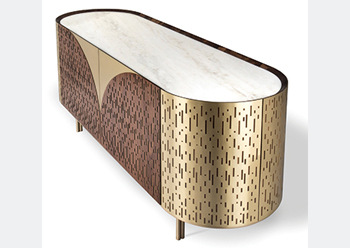 Essential Home, an innovative Portuguese modern furniture brand, intends to make a statement with the launch of Vincent, a mid-century sideboard with an art deco inspiration. Essential Home is a mid-century modern furniture brand that takes important historical and cinematographic references from the 1930s and 1960s and turns them into unique furnishing pieces. What started out as ‘Essentials’ in 2015, a furniture collection by the mid-century lighting brand DelightFull, quickly grew to be an elegant representation of mid-century modern design, thus creating a new name, and a new brand, Essential Home. “Soon we understood that this collection had a life of its own. Essential Home’ eclectic style inspired us to create more and more,” says one of the designers involved in the creation of Essential Home. Essential Home’s alluring designs are present in the most important interior design centres around the world, including London, Paris and New York. Marble-top round coffee table ... from 2XL. UAE-based 2XL Furniture & Home Décor has expanded its range with a choice of coffee tables that are described as being stylish and functional. These include Cudham coffee table, measuring 150 by 150 by 45 cm in a light grey colour. “You can top this Ottoman with a tray, creating the perfect place to display your favourite accessories or serve refreshments,” says a spokesman for 2XL Furniture & Home Décor. For those looking for gold accents on white, the company offers the Mimosa set of two round side tables. 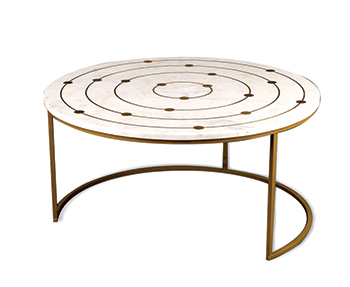 Also available is a marble-top round coffee table with brass inlays that is said to “inject a dose of drama and loads of character into your design scheme”. 2XL Furniture & Home Décor also offers the hexagon-shaped Hive coffee table, which is made of mahogany.